The whole story on this sled is at the bottom of the page. The finished restoration for you once again. 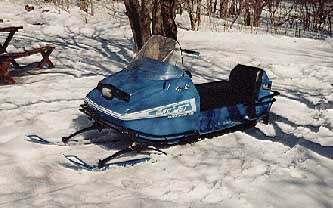 For those of you who are knowledgeable about the old Snow*Jets I must mentioned the following about my restoration. 1) The windshield and back light assembly are from a 1971 Star Jet. 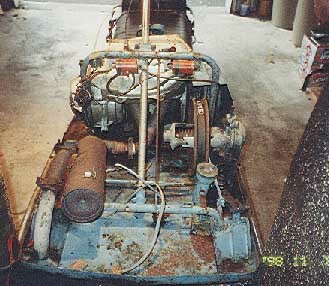 Everything else is original equipment on the 1970 Super Sport. Also the original seat was blue. However due to the lack of material I re-upholstered it in black. 2) This machine did not have the year stamped on it's ID tag therefore I had to do a great deal of research. 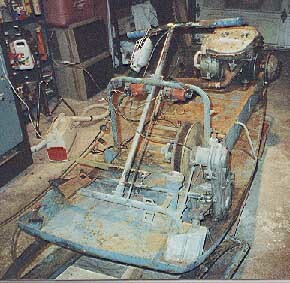 In New York I had no luck finding anyone who knows anything about old machines much less Snow*Jets. I found most of my information through the web in Canada. I would like to take this time to give special thanks to the following individuals, without them it would have been very difficult if not impossible. 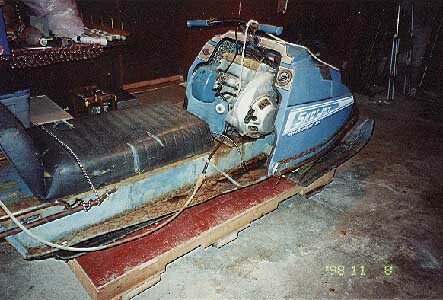 According to a reputable source this machine was abandoned for over 10 years in the Catskill Mountains of New York. It had been sitting under a worn tarp with a 38 caliber bullet hole in the gas tank. What can I say, curiosity got the best of me. 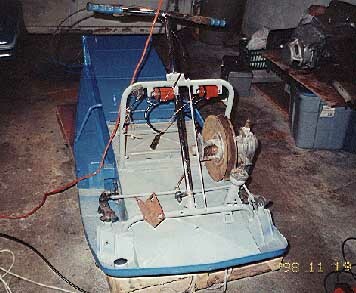 I towed it out of it's resting place with my 1960 Willys jeep and immediately started working on it. Within 2 hours I had it running and took a trip to a friends. It looked like hell but ran pretty good. After a suggestion from my girl friend I decided to bring it home and clean it up a little. Within the first hour of work on 11/08/98 there was no turning back. The attached photo's show some of the fun. The job was completed on 12/28/98.